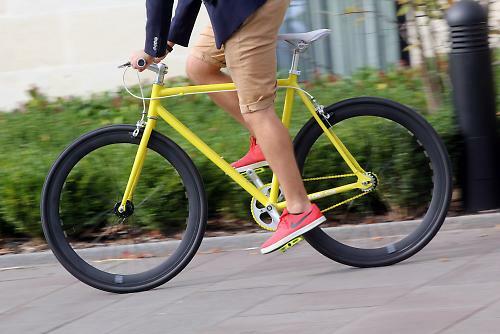 At its most basic, cycling is simple and fun, something that the Nolobi Singlespeed soon reminded me. After blasting around the local town centre on the 'Yellow Peril' for a few weeks I was grinning like an idiot and embracing my hipster apprenticeship . You can too for just £270, though there are a few compromises. Not heard of Nolobi before? You're not alone. They're from Hackney and the bikes were previously branded as No Logo. 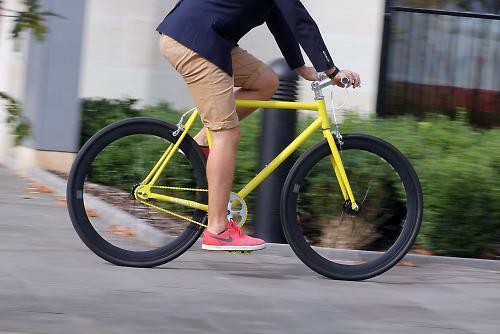 They pitch the Singlespeed as an urban bike. The lack of gears makes it perfect for commuting in the capital and so that's where you'll find Nolobi's biggest customer base. It's a hoot. The Singlespeed is very easy to ride thanks to a relaxed head tube angle giving a stable front end helped by the 52cm flat bar. It's very balanced and there shouldn't be any surprises, ideal for the beginner market Nolobi have in mind. Although not really a bike for taking out into the hills the frame is plenty stiff enough on the way up or down for the modest speeds you're likely to be achieving. When out of the saddle climbing there was some flex at the bottom bracket especially on the steeper sections as you push the 42x18 ratio round dragging 10.9kg of bike upwards. Once you've finally reached the peak its time to be rewarded with a bit of descending and with the weighty wheels and deep rims you can pick up a fairish old bit of speed. Handling wise it ain't too bad with the stable steering keeping the bike going where you want it. Just pray you don't have to stop: the combination of cheap no brand calipers and flexi levers isn't going to stop you in a hurry from anything north of 30mph. Back on the flat though, where the Nolobi is supposed to spend most of its life, the Singlespeed is much better mannered with changes in direction being quick and precise. I managed to get through some much smaller gaps in traffic than I was expecting to. Acceleration takes its toll if you've got a lot of stop/start for traffic lights and the like. Most of this is down to the wheels which while they look the part weigh a massive 4.8kg for the pair with most of that heft coming from the rims. That does include the tubes and Kenda tyres just in case you were worrying. They roll well enough once moving and stayed true after plenty of kerb hopping and pothole crashing. The tyres offer reasonable amounts of grip too considering the hard compound and thanks to the width and a bit of a tread pattern means they are perfectly at home on the canal path. Made from 6061 aluminium alloy the overall quality of the Nolobi frame is pretty decent. It's manufactured in China and while there is nothing flash about it like butting or hydroforming the welds are tidy and all finished off with a hardwearing coat of paint. 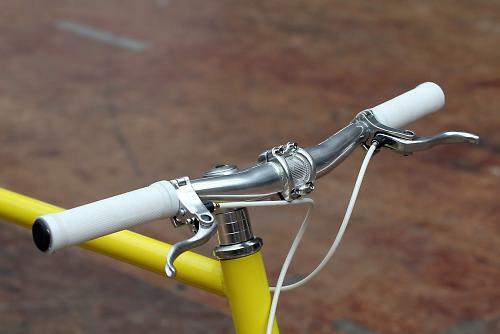 An aluminium fork with a 1 1/8in steerer completes the front end which feels stiff when cornering or braking. Security washers are used to prevent the wheel dropping out should the track nuts work themselves loose and the forks are drilled to accept the tabs. 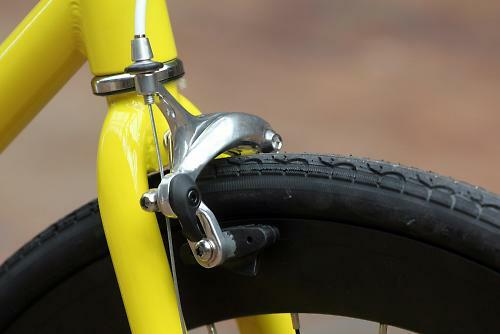 Being predominately intended as a single speed (the bikes do come with a fixed cog as well) the Nolobi has eyelets for the rear brake cable running along the top tube, something you don't see very often on non-geared bikes. It allows for a full outer cable to travel the length of tube to making it ideal for wet weather. The components that make up the rest of the bike are all basic but do the job. 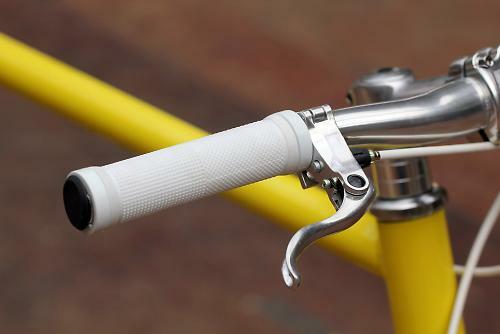 The alloy bars, stem and seatpost are smart looking and I've seen components of this type on bikes costing double the price. The saddle was comfortable for the short style of rides the Nolobi is likely to be used for with minimal padding for the more upright position. As with the majority of track chainsets the unbranded one on the Nolobi uses a square taper bottom bracket. These give plenty of options for getting the spot on chainline required for smooth running with the added bonus of being easy to replace and refit with just the minimal amount of tools. Our chainset fitted smoothly onto the tapers and ran pretty true, not something that happens that often with budget track components. It's stiff too: I couldn't feel any flex under acceleration from a standing start. The rest of it goes a little bit downhill now though. We'll start with the brakes. Both the calipers and levers are very flexible which severely limits their modulation and emergency braking. At 10-12mph it's acceptable but any quicker than that you have to really be on the ball. The hard compound brake blocks and painted rims are also a factor. The free wheel mechanism is quite sloppy on pick up too. Hard acceleration is met with an initial delay before engaging. It's not massive, you're only talking a fraction of a second but it's unnerving especially since a lack of chain-tugs means the rear wheel is constantly making its way up the dropouts, you never quite know if it's the freewheel or if your chain has gone slack as you make a dart for a gap in the traffic. I've mentioned the weight of the wheels/tyres combo already but I'll reiterate just so you can get your head round it – 4.8kg. They might look the part but they certainly limit your route options if you live somewhere undulating. They are bombproof though as I said above and I suppose you have to decide what your priorities are. Size wise you get three options: 53cm, 56cm or 59cm. Nolobi offers suggestions of rider height for each one though it's not an exact science especially for the beginner market they're after. One thing there is plenty of choice of though is colour. Frame, wheelsets, components and tyres are all changeable. 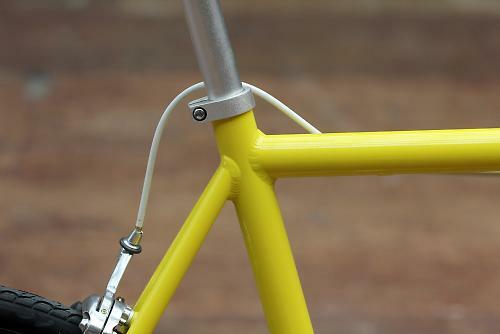 There is an off the peg range for the £270 base price but should want something a little more bespoke you can use the 'build a bike' page to spec it how you want. You can even select your background to see what it would look on your local street corner. Overall the Noboli is a pretty decent bike. It has a good frameset and while the components are a bit of a mixed bag, value for money is pretty high. With the arrival of road bikes to the market with gears and carbon forks for just thirty quid more things are getting a very competitive though. The Noboli is a fun bike to ride and is certainly engaging round town. Cutting through traffic or whizzing along cycle paths it handles steadily and apart from the brakes shouldn't give you any nasty surprises. 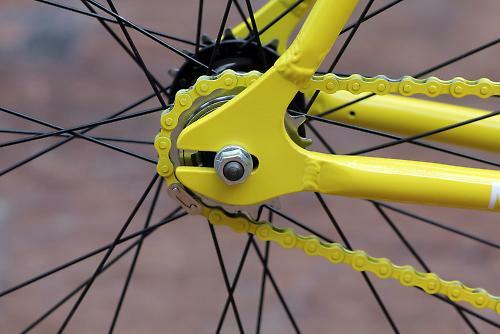 The components are perfectly up to the job of short commuting use or nipping to the shops I think if you were doing much more than that you're soon going to want to upgrade the brakes and treat yourself to lighter wheels and tyres. 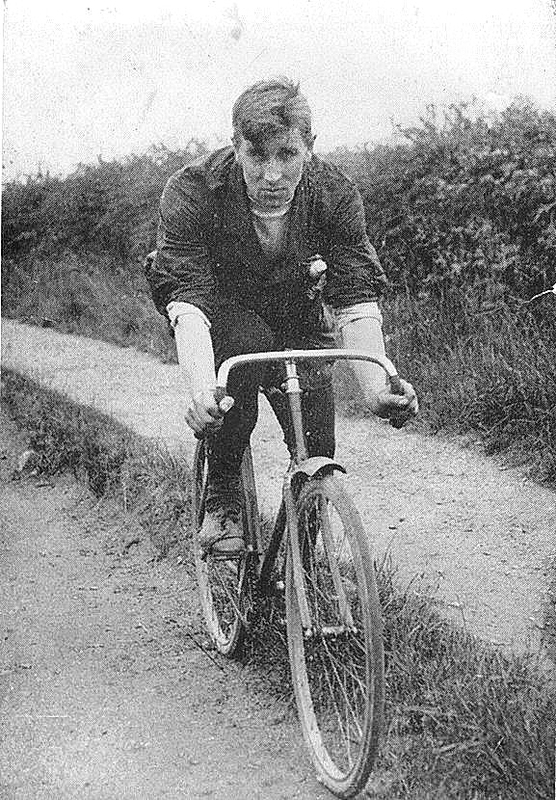 The bikes were originally designed and priced for new cyclists as an alternative to BSO's from supermarkets and the like. The plan was to offer an affordable, lightweight fun bike to ride and I think Nolobi have achieved that goal for the new or occasional cyclist. The welding looks neat and it's not too bad on the weight front either. The paint finish is thick and hardwearing which is ideal for the urban style of riding its intended for. A reasonably short top tube (in relation to the seat tube) gives an upright ride position which is ideal for riding in traffic. Comfort was pretty good helped a lot by the large volume Kenda tyres. The frame felt stiff at the contact points and did show any sign of flex during hard efforts. Pretty good, the heavy wheels take a lot of effort to get moving though. Really easy to ride in traffic and on the open road thanks to stable handling, ideal for beginners. 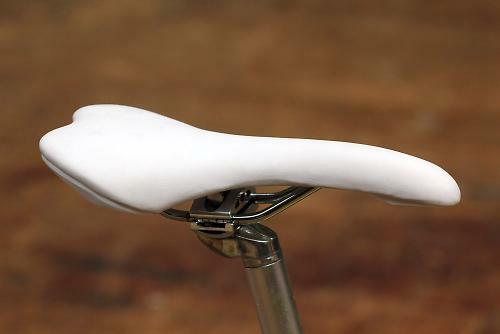 The saddle was comfortable as were the handlebars providing a good position for distributing your weight. The chainset showed good levels of stiffness as did the bar and stem combo. The wheel weight took its toll after constant start/stop riding through town. Apart from looks they don't really provide any advantages so maybe an option of standard depth 32 spoke wheels would make sense. The components were fine, the chainset running true and stiffness levels were good. As I mentioned there was some slop in the freehub before engaging but its not a deal breaker. The brakes though were pretty scary. They were pretty bulletproof over the test period. I can understand the deep section for aethetics but I personally think the bike would be more fun and engaing to ride with a more standard lighter wheelset. There isn't much to get excited about but its bang on for the money. Most of components performed well and look good to. The Nolobi is a bit of a mixed bag for me. The price is key for the customer base they're after and for that they've provided a decent quality frame paired with budget components. There is a lot to like about the ride to with plenty of engagement for the rider with stable handling for negotiating traffic. As I've mentioned though if I was commuting in the city with constant stop/start traffic and lights I wouldn't want to be spinning up those wheels over and over again. It gets 3.5 stars as the good points come out on top. Any other options like this at a similar price? 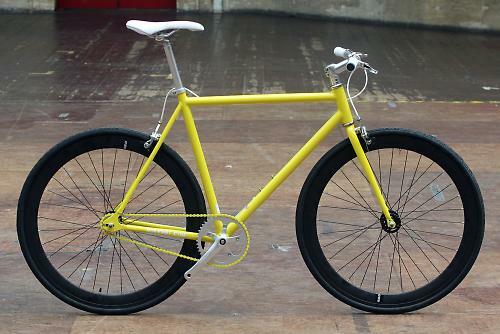 I have a decent road bike, decent cross bike but would love something like this for popping to the shops, gym, whatever. take a look at MBA track bikes - there's normally a few on ebay or Amazon for significantly less than their £450+ RRP. I've got one and they are great for exactly what you mentioned. They look pretty nice actually - thanks! Might have to get one of these to match my reduced ears (no-lobe-y). I'm old fashioned, I like gears. Surely having gears is more modern than singlespeed? Won't the price start creeping up once I start buying singlespeed/urban specific cycle clothing? This looks very smart for the money but surely it's possible to run QR hubs on singlespeed these days. For just a little more, they could run to V brakes and mudguards. And am I the only person left who still uses bar ends with flat bars ? I think No Logo have a reputation for being cheap and heavy. I would rather spend an extra 50 bucks and get a Fuji Classic. Great steel frame and not too heavy either. Had mine 4 years and it's been great. use one of these for commuting from Bath city centre up to uni. just about manage the hills! I ride a Viking on my commute. Pretty hefty but solid.
" the combination of cheap no brand calipers and flexi levers isn't going to stop you in a hurry from anything north of 30mph." This bike will never reach such speeds even downhill. 30mph being 48kmph can never be achieved with a 42x18 gear ratio. Also, my personal opinion is that the bike is junk. The frame looks like really bad build quality and they even forgot to add chain-tensioners, which is a basic requirement for a frame with horizontal drop-outs. Otherwise you won't be climbing many hills. My advice, based on my almost 30 years of biking experience, is to stay well away from such cheap and unknown brands. That bike is more a kin to a toy than a serious bicycle. Why is ratios kind of irrelevant? You do need some sort of gear to travel forward and when the ratio is 42x18 it isn't a very big one. Saying it's hard to stop at anything north of 30mph kind of belies the actual capability of the bike. Also, you giving that bike a 3 and half stars shows you haven't ridden very many good bikes or the review is just product placement in front of your audience for a fee. That's rude, because it shows no respect for your readership. A gear propels you forward I agree but if the downhill is steep enough to take you past your cadence range ( I regularly do 35+mph on 42/16 fixed) gravity can take you faster as the test hill did. Downhill speed is not the Nolobi's natural playground and the review took that into account but it was still tested. As far as my integrity as a reviewer goes I achieve nothing by lying and neither am I expected to by road.cc. At the end of the day I'm playing with people's livelihoods and my reviews respect that. The Nolobi is good (hence 3.5 stars) at what it is designed for, getting bums on bikes for short journeys around an urban environment. I gave it a thorough test in all environments just in case thats where the rider finds themselves. 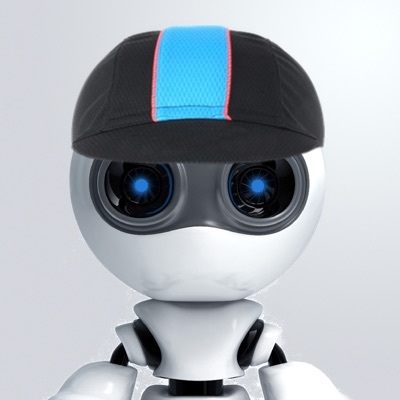 Overall though the final score comes from does it do the job it was designed to do.